Mini Green Power et ENGIE Innovation se sont rencontrés lors du 2ème Sommet des startups organisé par le magazine Challenges en avril 2017. 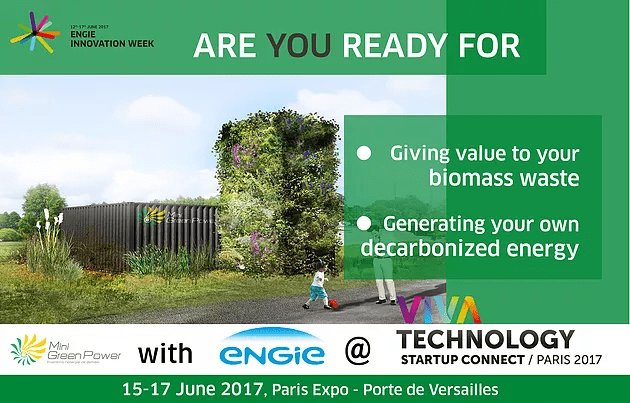 A cette occasion, ENGIE a invité Mini Green Power à venir exposer sur le Lab Energy d’ENGIE lors du salon Viva Technology les 15 et 16 juin prochain, Porte de Versailles, à Paris! Retrouvez l’article paru sur le site de Fab ENGIE avec l’interview de Gonzague de Borde, Responsable de Développement de Mini Green Power. Thursday, June 1st 2017 // Mini Green Power and ENGIE Innovation met at the 2nd startup congress organized by the Challenges magazine in April 2017. ENGIE invited Mini Green Power on this occasion to be an exhibitor at the ENGIE Lab Energy during the Viva Technology show on June 15th and 16th, in Paris, Porte de Versailles. Find the article published on the site of ENGIE Fab together with the interview of Gonzague de Borde, Business Developer at Mini Green Power.